The Safes, a Chicago band made up of three brothers - Frankie, Michael and Patrick O'Malley - play a hard-hitting mix of punk, power pop and garage rock. Formed in 2003, they've already put out two LPs ("Family Jewels" and "Well Well Well") and two EPs, including the recently released "Sight of All Light." Clocking in at under 12 minutes, the five-song disc rocks hard with no frills, refusing to indulge in any of the pretensions that far too many indie bands hold dear. As they barrel through tracks that conjure the likes of The Ramones and The Kinks, it's hard not to appreciate their pure rock 'n' roll spirit. The opening title track packs loads of hooks and grit into 1 minute and 53 seconds, while "Greed," with its ringing guitar, melodic punk drive and gritty vocals reminiscent of The Clash, is another highlight. 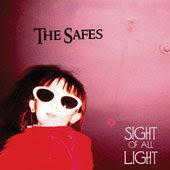 The Safes are set to complete their next full-length this winter, and "Sight of All Light" is a solid teaser. Check out the band live on November 26 at Beat Kitchen and December 19 at Quenchers.